Chan Chich and Gallon Jug are part of a very large private holding in western Belize, adjacent to its border with Guatemala. They raise or grow all of their own food on the ranch. Barbara went horseback riding one day and rode through the pastures in the midst of cattle, and also through a coffee growing area. 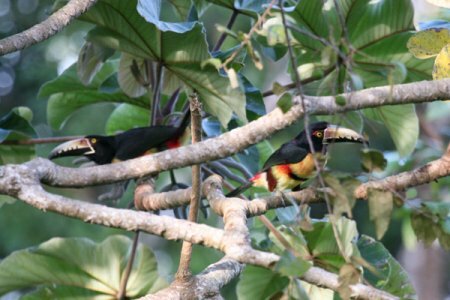 Chan Chich has been a birding destination for many birders for many years. I heard about it years ago and it has for a long time been on my list of places that I wanted to visit. Chan Chich Lodge has a dozen or so separate cabanas. They are straw-thatched and very nicely appointed. All dining is centered in the Lodge. It was a step up from Lamanai, which, in turn was a step up from Crooked Tree, at least in terms of the luxury afforded by the cabanas and the Lodge. 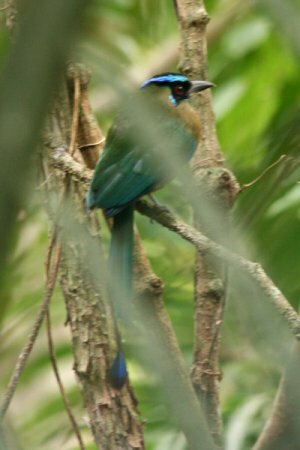 As indicated in my earlier posts, however, the birding at Crooked Tree and at Lamanai was not much different from what we found at Chan Chich. On the drive to the Lodge we were able to observe the substantial damage caused to the jungle by the winds of Hurricane Richard, which hit the area hard in October, 2010. With the help of the excellent guides provided by the Lodge, we saw many of the same birds at Chan Chich as we had seen at Lamanai. 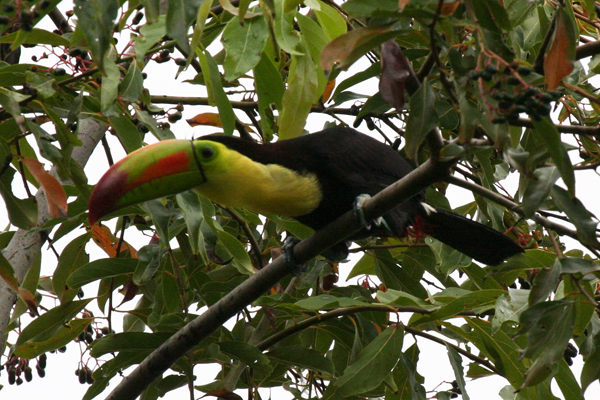 Our guides reported that for a while after the hurricane, many of their birds had disappeared, but were now returning. 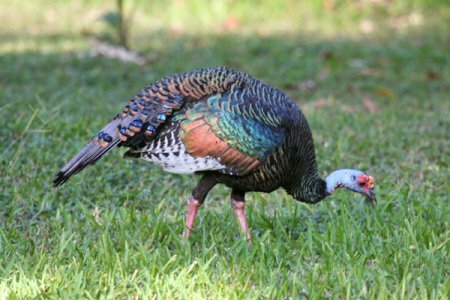 New “Life Birds” at Chan Chich were plentiful, however, and included the strange and beautifully colored Ocelated Turkeys, which were very tame. 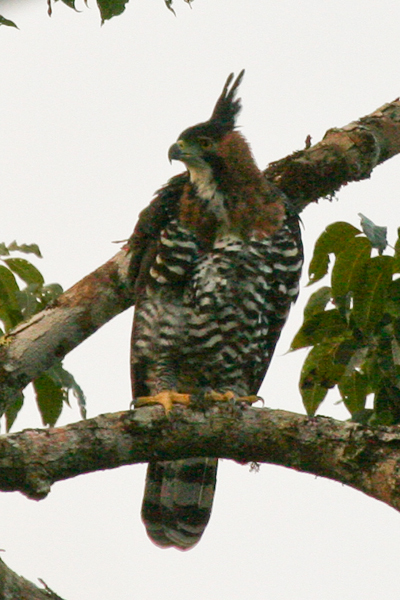 A pair of Ornate Hawk Eagles was nesting along a trail. 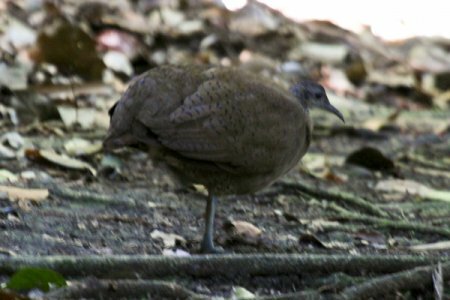 The Great Tinamous were quick to disappear as soon as they were spotted. 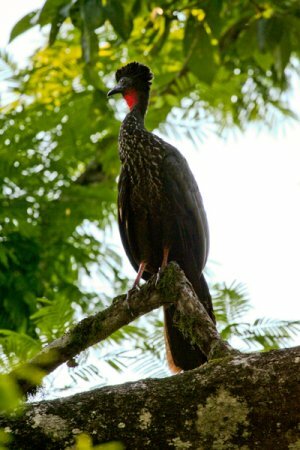 This Crested Guan was watching us as we were watching him. We saw a Sungrebe floating by turtles basking along the shore. 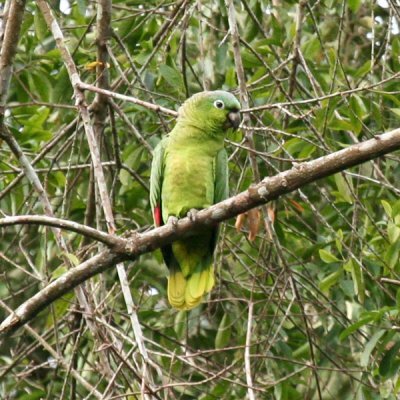 We also saw Great Currasows (seen also at Lamanai, but better views here), a Scaled Pigeon (uncommon here, but found by Barbara), Gray-fronted Doves, a Squirrel Cuckoo, Long-billed Hermits, Scaly-breasted Hummingbirds, White-whiskered Puffbird, Black-cheeked, Pale-billed and Chestnut-colored Woodpeckers, and Ruddy, Tawny-winged and Northern Barred Woodcreepers. 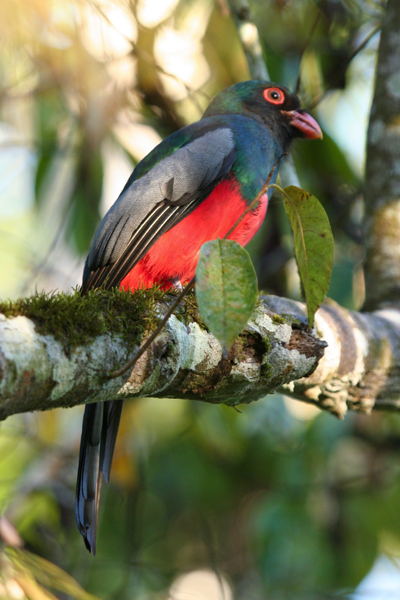 The colorful Slate-tailed Trogon was always fun to see. We spotted a Plain Antvireo, Stub-tailed Spadebill, Ruddy-tailed Flycatcher, Yellow-bellied Tyrannulet, Sulphur-rumped Flycatcher, Eye-ringed Flatbill, White-collared Manakin, White-breasted Wood-wren, Golden-crowned Warbler (the only Warbler species that is resident year-round in Belize), Red-crowned Ant-tanagers, Scrub Euphonia, Olive-backed Euphonia, and Blue-black Grosbeak. The Mealy Parrots made quite a commotion around the lodge at breakfast time and again later in the afternoon. Another noisy fellow was the Oropendola which could be seen and heard around the lodge. We stayed at Chan Chich 4 nights. On the last day we were driven from the Lodge to Gallon Jug (about 6 miles) and were picked up there in a small plane and flown to the airport near Belize City. This was a much better way to travel than on the back-country roads. Belize is in the same time zone as Iowa. We arrived back home, through Atlanta, about 11:00 p.m. that night. Belize, formery British Honduras, is a small country of about 500,000 people. English is the official language. Afteer obtaining independence from England about 40 years ago, Belize has remained a part of the British Commonwealth. In the west, where we spent most of our time, many of the residents have come from Guatemala and speak Spanish natively. Without exception, we were treated in a friendly and welcoming fashion. Everyone we met, even while out on the roads walking, greeted us with a smile or a wave. Had we spent time in the more populated areas of Belize City or along the coast, we might not have had quite the same experience. Friends who have taken beach side or island based vacations there, however, say that it was a great experience and they would go back (for the sun, the golf and the beaches, not for the jungle as some of their somewhat peculiar friends just did). The boat ride up the New River to Lamanai Outpost took about an hour. For the entire ride we reveled in the bright sun, blue sky and the serenity and clarity of the river and its jungle edge. The only activity consisted of two or three small boats bearing local fishermen. The only substantial human habitation consisted of some Mennonite cattle and sugar cane farms and support facilities. The Mennonites arrived in Belize in the 1950s and have established a remarkably successful agricultural empire in the country. Most of the country’s meat, eggs, corn and sugar production comes from the Mennonite farms. We docked at Lamanai around noon and were treated to cold drinks immediately. The cabanas at Lamanai are very comfortable and attractive. The Lodge, where all meals are served and activities commenced, was a short but steep up-hill trek from our cabana. Our cabana overlooked the Lagoon and was on the edge of the compound, so it provided ample opportunity for birding right from our veranda. 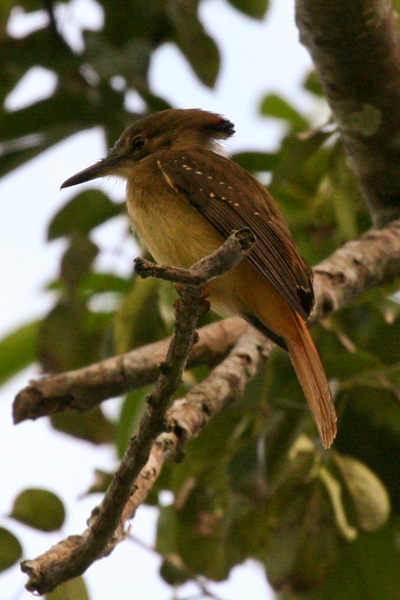 Smoky-brown Woodpecker, Olivaceous Woodcreeper, Tawny-winged Woodcreeper, Strong-billed Woodcreeper, Northern Bentbill, Bright-rumped Attila, Ochre-bellied Flycatcher, Yucatan Flycatcher, Red-capped Manakin, Masked Tityra, Mangrove Vireo, Yellow-winged Tanager, Red-throated Ant-Tanager, Red-legged Honeycreeper, Yellow-throated Euphonia, Blue Bunting, Black-headed Saltator, Green-backed Sparrows, and Montezuma Oropendola. A long list. The best bird at Lamanai was not a new bird for me, but the view that we had of a pair of Jabiru Storks was unforgettable. 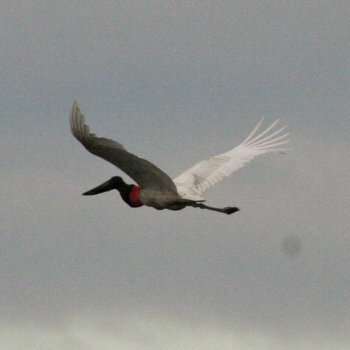 As the sun was going down, we were sitting quitely in our boat with our guide when we spotted the first Jabiru flying across the Lagoon from the south. It landed in a very large tree on the west bank, quite a distance from us. The tree contained the nest that this pair of Jabirus has been using for the past 14 years. 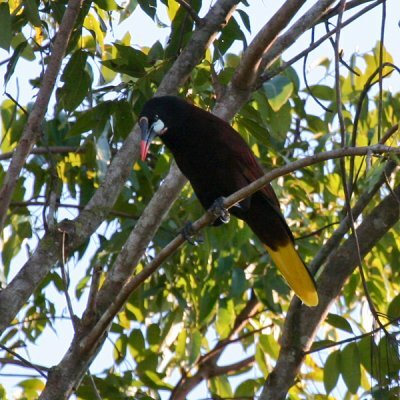 As the sun was setting, the second Jabiru joined its mate atop the nest and the two of them preened in a stately manner. The storks are 5 feet tall and have an 8-foot wingspan. Black Howler Monkeys were abundant at Lamanai. 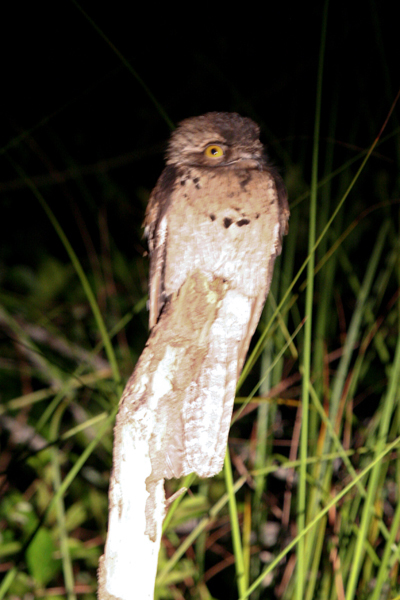 They made their presence in the tree tops very evident by persistently roaring challenges to other groups of Howlers. Howler monkeys don’t howl; they roar. The sound is very much like that of the lions we heard roaring at night when we were in Botswana a couple of years ago. It is difficult to believe that such volume could come from these 40-50 pound monkeys. They would be frightening but for the knowledge that there are no lions in Belize and the Monkeys stay up in their trees. Often their howling could be heard during the night or in the early morning hours as well as during the day. The quiet Spider Monkeys were more acrobatic, or at least more inclined to display their acrobatic talents in leaping great distances from one tree top to another. On day 2 we explored the Mayan temples at Lamanai. These structures, some dating back over 2,000 years, were redicscovered a century or two ago. Much excavation has taken place over the years to reveal the original architecture and art and to recover what might remain of the artifacts. Lamanai was an important trading post for the Mayans as it was located near the major lagoon that connected to the Caribbean and the eastern shore line of Central America. Excavation and restoration has slowed in the past few years because of cutbacks in funding. 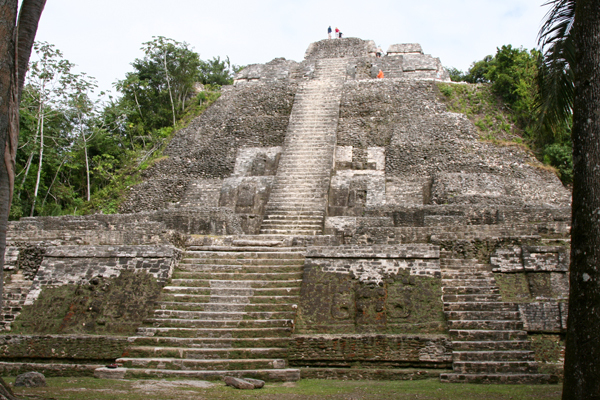 Nevertheless, this old Mayan city remains a big draw for tourists in Belize. We saw far more people there than anywhere else that we traveled (except the airport). Fortunately, the Lodge arranges for its guests to be guided through the ruins early in the morning, before it opens to the general public and the crowds arrive. When I say crowds, I don’t mean crushing numbers. Just groups of people, usually in the company of a guide explaining the history of Lamani. It was pleasant to be there early in order hear your own guide and take your time as your small group (7 of us) sees fit. After lunch on our last day at Lamanai we were met by a driver provided by our next Lodge, Chan Chich. The drive was pretty bad. It took over 3 hours to go about 60 miles to Chan Chich. The roads were very rough and dusty and the vehicle was hot. Our driver had the unfortunate attribute of talking very loudly and nearly non-stop. My ears were ringing, among other maladies, by the time we arrived at Chan Chich. 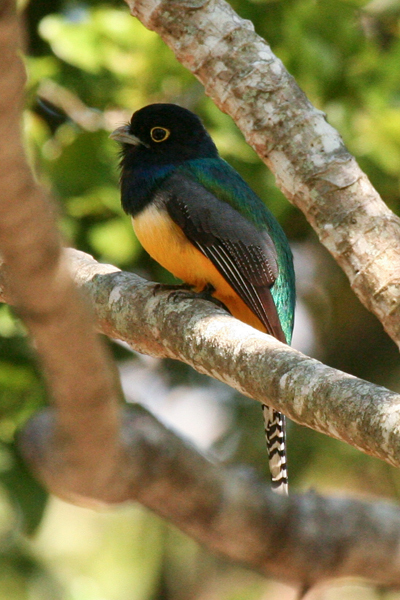 I highly recommend Lamanai Outpost for those interested in the combination of excellent birding and fascinating Mayan history and ruins. The lodging and food are both good. In the next installment I will summarize our experiences and impressions of Chan Chich.